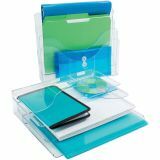 Lay it flat for horizontal organization. Stand it upright for space-saving filing. Mount it on the wall to recoup your valuable desk space. 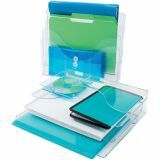 Open-ended design allows use with letter, legal and oversized documents or files. 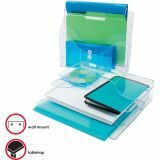 Deflect-o Three Tier Desktop File Organizer - Sleek desk organizers, each with three-tiered compartments, allow you to hold a variety of documents, binders, files and supplies while taking up little room on your desktop. 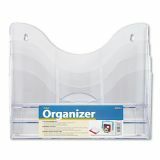 Organizer lies flat for horizontal organization or stands upright. Wall-mountable. Open-end design for oversized files. Ribs under each compartment prevent slumping. Ribs in bottom of each section eliminate slumping.